A US woman discovered the patriotic stars and stripes top she wears every Independence Day bears a striking resemblance to the Panama flag when her grandson watched the World Cup. Shirley Cheesman, 88, has worn the shirt every 4 July for more than 25 years. Her grandson Dale, from Houston, Texas, revealed the mix-up on Twitter. His tweet has been shared thousands of times as proud Panamanians invited the family to visit their country. 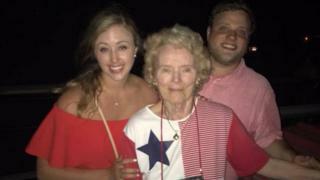 “My grandma has worn the same shirt with red, white, blue and stars to celebrate the 4th of July for more than 25 years,” he wrote. “Thanks to the World Cup we finally noticed it’s the Panama flag. “Over 25 years of treason,” he added. Dale told the BBC that he was watching the World Cup with his brother-in-law when they noticed the similarity. “We were on a family trip celebrating the 4 July weekend early because it’s on a Wednesday this year. “We showed my grandma at dinner. Dale says his grandma will continue to wear the shirt. Panama played in the World Cup for the first time this year. The team was knocked out in the group stages after losing all three of their matches, including a 6-1 defeat by England. But if Panamanians were in danger of feeling miserable after their World Cup exit, Shirley’s longstanding sartorial support has raised a smile. Many suggested she should mark 3 November – Panama’s own Independence Day – in her diary. Invitations were extended for Ms Cheesman to visit Panama herself. And if Dale and his family do ever make the trip, they’ll certainly be well fed. One Panamanian social media user invited them round for Sunday lunch. Not everyone was convinced, though, some noting that the stripes on Ms Cheesman’s shirt do not appear on Panama’s flag. And others were just more impressed that the shirt looked in such good nick after more than 25 years of annual use.